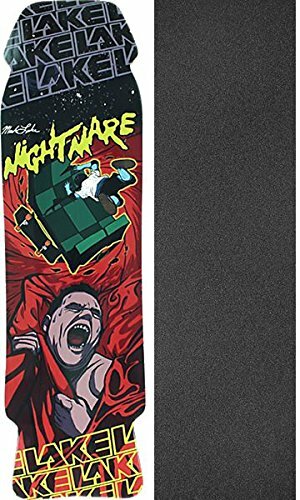 This professional quality Lake Skateboards Nightmare Skateboard Deck measures 8.75" wide x 32.5" long and is suitable for every skill level from beginner to pro. A versatile deck that's perfect for street, pool, park and vert, it's solidly constructed from high-quality 7-ply North American maple and is built to last. Holes have been predrilled to make skate truck assembly easy. Includes: One (1) Lake Skateboards Nightmare Skateboard Deck plus one (1) sheet of Mob Grip Perforated Griptape. Note: Grip tape is NOT applied to board. Once applied, product cannot be returned or exchanged. If you have any questions about this product by Lake Skateboards, contact us by completing and submitting the form below. If you are looking for a specif part number, please include it with your message.